The first studio album since 1990 from the recently reunited Styx has one of the most apt titles I've ever seen. Brave New World starts with soul-infused track "I Will Be Your Witness" bears semblance of a classic Styx. If there is a hit on here this one is screaming "Play Me!!" In all honesty, I was expecting more after the first track. Maybe it was the rollercoaster intensity of the track order... I was ready to say hideous things about the album until my 8th listen. It is like watching The Phantom Menace - the first viewing you are waiting to see characters you remember and remain judgemental about who looks like a Jedi or not. The second time you pull the expectations and see it for what it is. After repeated listenings, several tracks here start to grab your ears. You forget that you are looking for another "The Best Of Times", "Babe", or "Renegade" and see the songs for themselves. James Young's dark vocals on "What Have They Done To You" are mesmerizing when countered with Tommy Shaw's own pipes. 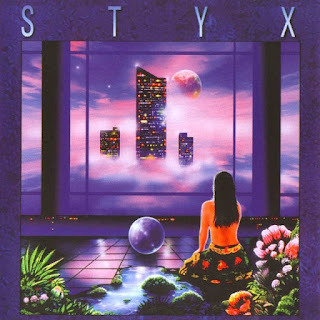 Shaw's guitar controls most of this album - sometimes so in your face that Dennis DeYoung ballads like "Goodbye Roseland" seem stark and empty. Yet, there is redemption with "While There's Still Time" which also has single written all over it. The book Brave New World by Aldus Huxley described an inhumane society controlled by technology and a loss of soul. It can describe some of this album. But without the Huxley reference this is a brave attempt at changing the sound of a band that has spent three decades pleasing fans. Despite a few very notable tracks, I wasn't sure I liked where their new world was going. But, I'm starting to like it more and more.